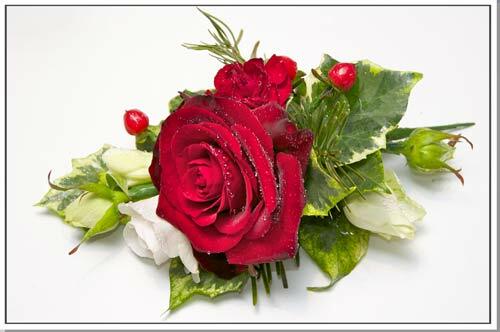 Christmas wedding flowers can be all rich red and festive with deep greens and golden highlights or they can be a sophisticated cool white and silver. 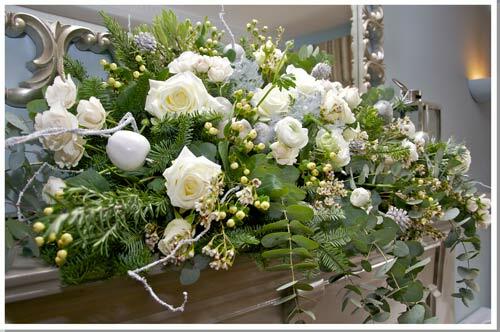 A frosty white Christmas flower theme was chosen by our bride Tina. 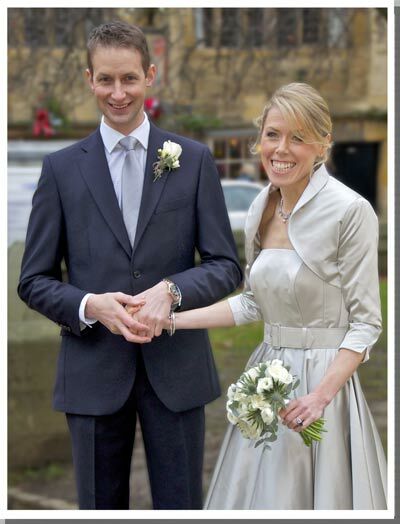 She had lots of ideas on how she wanted the overall look to compliment the charming Kings Hotel, in Chipping Campden. 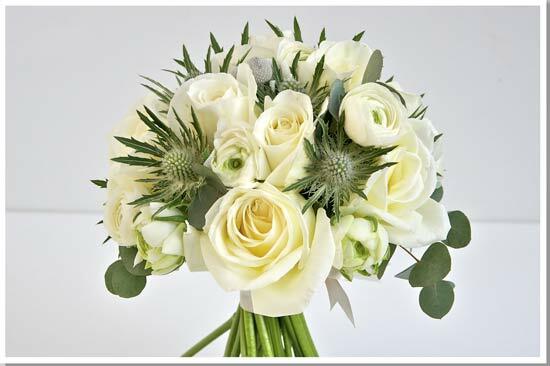 White roses always are popular as they are classic and refined. 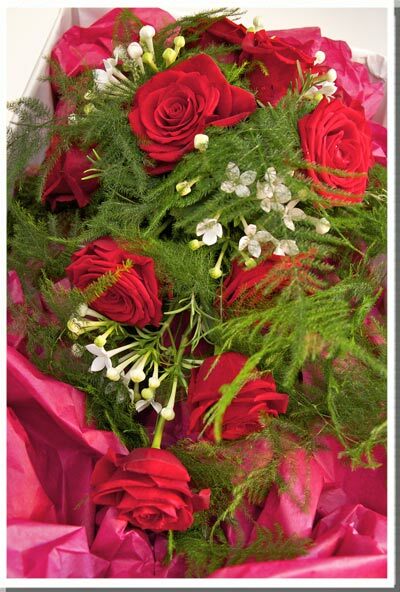 We found an especially gorgeous scented one and filled the arrangements predominantly with the beautiful Norma Jeanne rose. 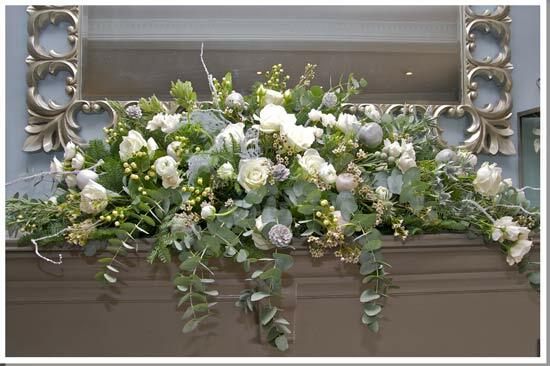 White stocks, grey eryngium and silvery grey eucalyptus foliage kept the whole look soft and frosty white Christmas. Whereas, it was a traditional red and gold Christmas wedding for Tanya and Chris. The rich velvety red rose, "Grand Prix", berried ivy, shiny red hypericum berries, glossy green foliage was the cheerful theme for this Christmas wedding in the Cotswolds. Tina looked classically elegant in a calf length grey dress and carried a small hand-tied bouquet of scented white roses with blue eryngium thistle and eucalyptus. 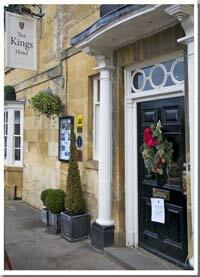 The Kings Hotel, in Chipping Campden has a wonderful feel to it both traditional, yet timeless and modern. An impressive mantelpiece arrangement took pride of place in the bar area. The creamy whites and soft grey foliage looked wonderful against the Cotswold dove grey walls and the marble fireplace. 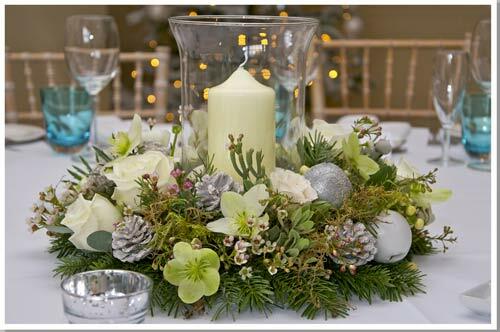 For the table arrangements, storm lanterns with church candles were placed in a Christmas ring of blue spruce, eryngium, eucalyptus, roses, hellebore's and dipped and waxed fruits. the large round tables looked fantastic in the historic dining room of the Kings, softly lit by the glow of the candles. 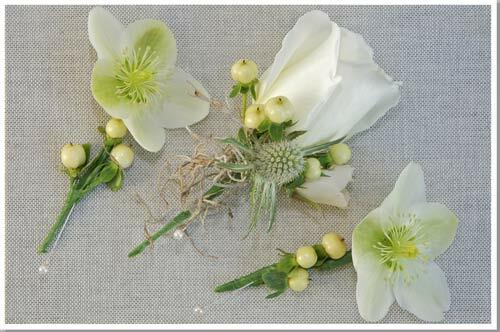 A mixture of 'Norma Jean" roses and delicate Christmas roses, combined with eryngium and hypericum berries, were used to give something different to the standard rose buttonhole. 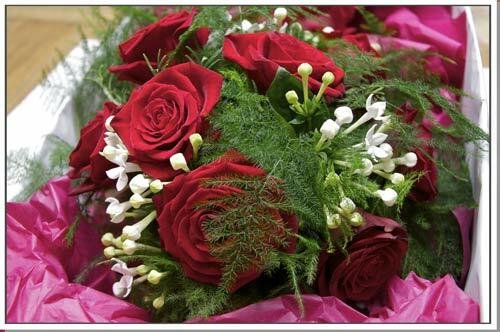 she loved the rich red tones of Christmas flowers. 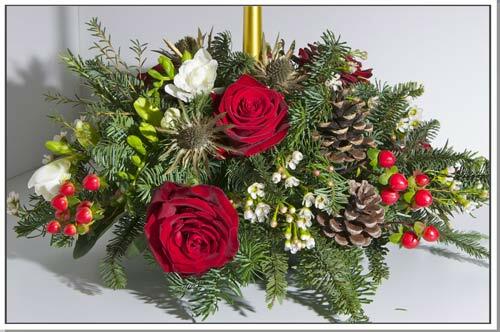 Table arrangements of blue spruce, holly, ivy and rich red flowers were chosen. All complimented by a gold candle and ribbons. Tanya's bouquet was an elegant shower bouquet using soft ruscus as the flowing foliage and "Grand Prix" roses mixed with white bouvardia. 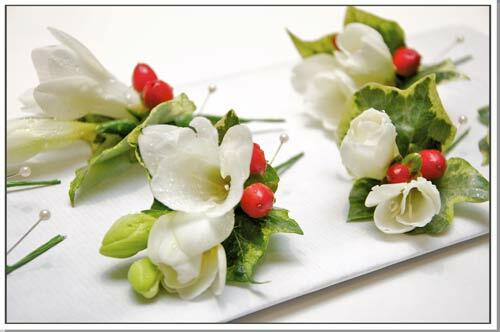 Tanya's mum had a simple festive corsage, designed to perfectly compliment the rest of the flowers. 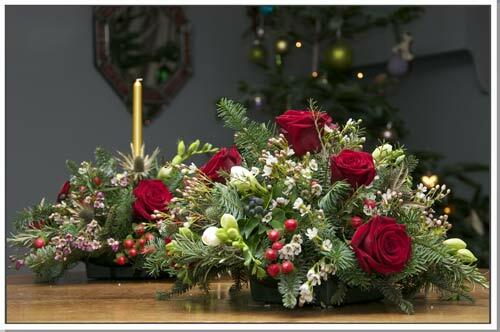 or to request a free, no-obligation, consultation, please ring our Badsey flower studio on 01386 832120 or 07771 776173, to speak to Catherine about your festive flowers ideas. 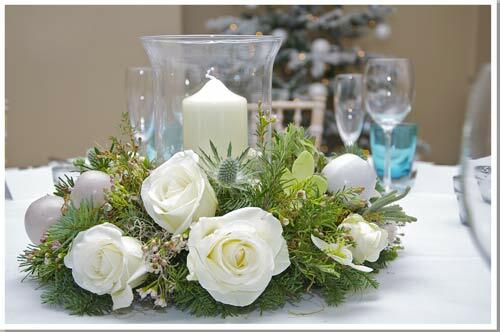 Alternatively, complete our simple Contact Form to start the process of choosing yourperfect Christmas wedding flowers.